I’m going to be completely honest, I used to have a fear of traveling. “But you travel all the time,” is what you’re probably thinking. I know, I know, but there was a time when the thought of traveling far was presented to me, a wave of anxiety would flow through my body. Let me know if any of these anxieties or fears sound familiar to you. Do any of these sound familiar? If you answered Yes, then this post is for you. I can’t tell you how many times I’ve gathered up my friends, discussed travel plans, requested the time off of work, and when it was time to book the trip, I ditched the plans, dug deeper into work, and returned to my previous life that was calculated with the same boring routines and schedule every damn day. I was so tired of hearing about my other friends’ travels and explorations. I was really feeling dissatisfied, doubtful, bored, and that I was truly missing out on something soul deep that I couldn’t explain. So, I decided to do something about it. I became so frustrated that I put my foot down and decided I am not letting FEAR stop me any longer from going on my dream vacations and stop me from exploring history, culture, art, and far away lands. 1. It’s time to leave your comfort zone ladies and gents. What’s the worst thing that can happen while you are away? I want you to write down the top 10 worst possible things that can happen to you while you’re traveling. Then I want you to write down the top 10 best possible things that can happen while you are traveling. Read your answers several times. Then you tell me which option seems better. 2. Do your research and read reviews. There is no need to feel overwhelmed while you are traveling. Make a list before you jet of places you want to go explore, places you want to eat, make a list of an itinerary. Once you land to your destination and if things don’t go as exactly planned, that’s OK! The Universe is guiding you to where you need to be. & If you get to experience everything on your list, then great! Having this itinerary and prep will get you more excited than anxious about your trip. 3. Guess what friends? In every country I’ve traveled to, everyone speaks English. In instances where people didn’t, I have an app on my phone that translates when you speak into it. That has worked well for me. I also enjoy hearing other languages. Once you emerge yourself in someone else’s culture, you will surprise yourself of how quickly you will pick up on unfamiliar languages. It’s the best way to learn! (I’ve picked up Spanish, Greek, & Italian, very quickly. I will say German is a hard one) If you need to find someone that speaks English, go to a pharmacy. They must be qualified to speak in English. 4. 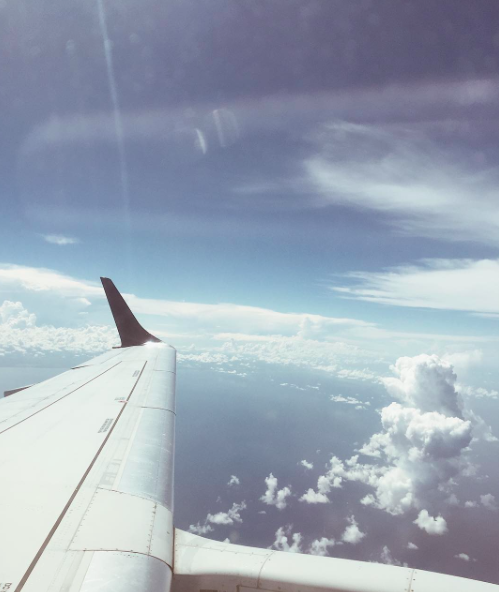 Your airplane flight is probably the safest part of your trip. The chances of a plane falling from the sky are extremely small. I have a friend Gary, who is an airplane expert. Whenever I feel the slightest bit of turbulence or anxiety and immediately think DEATH, I text him. Now, I know everyone doesn’t have a “Gary” they can text during these anxious times, but here are some pointers I’ve learned from him. -The design of an airplane is safely built to withstand the worst possible weather conditions. -Newer technology in the cockpit will warn pilots of approaching terrain or conflicts with other planes way ahead of time. The flight controls and the display are tested to make sure all the necessary information is easy to see and easy to operate. The gadgets and technology in the cockpit make it easy for the pilot to navigate and I believe most airplanes are guided by GPS and self-fly. -Your pilot is skilled and experienced. So much effort goes into pilot training. -An airplanes wings can bend up to 90 degrees, and are designed to bend and bounce. -Planes can not go down from turbulence, even though it may feel like it during those bumps. -It doesn’t matter if you leave your cell phone on. 1. Travel Companion kit http://www.saje.com/travel-companion-22290901.html and 2. Sleep Well kit http://www.saje.com/sleep-well-22250501.html . I bring Benadryl to help me sleep if needed. I listen to calming meditating music in my headset and deep breath until I’m relaxed or sleeping. Kava is also a natural anxiety reducer you can purchase at your local health food store. 5- The first time I flew alone was the most liberating experience of my life! What the F was I so scared of in the past? I have to tell you that the BEST feeling is conquering your fears. I’ve traveled so many times at this point, that traveling alone was actually easier than going with someone. I learned that it’s not true when you’re alone, you can’t rely on anyone. If I ever had any trouble storing my carry-on over my head in the plane, people are always nice enough to help. If I wanted to avoid getting lost, people passing by me were more than happy to give directions. I’ve actually made foreign friends this way. 6- To eliminate the fear of getting hurt while traveling, you can get international medical insurance that covers medical costs in the country you are about to travel to. There are doctors, nurses, and medical staff in every country in the world. & The chances of you getting hurt are slim. 7- “It’s too expensive!” Lies. Okay, well some travels can be expensive BUT preparing and researching will save you a lot of money! Look for Air B&B that can be cheaper than hotels, start searching early in the year for affordable flights and early bird deals. They are out there. Google deals and look on Groupon for deals on tours. Then, start to save your money, even if that means eating home more often rather than going out to lavish dinners 2x a week. Put away a small amount every week and eventually, the sum will grow to the amount that will support your dream vacation! These travel fears are based on stress and anxiety. A lot of it is fueled by the media. FEAR= FALSE EVIDENCE APPEARING REAL. I want you to take a deep breath and focus on the good, not the bad. Before I started my journeys, I was timid, I didn’t have much life experience and constantly felt anxious. I am so happy to say that I don’t know that girl anymore. Traveling HEALED me. I fell in love with food and learned the importance of cooking healthy meals. I fell in love with different cultures, people, and languages. I’ve fallen in love with adventure and history. Travel has taught me compassion. Travel has strengthened my love for animals. Travel had reconnected me to my spirituality. I used to run away from stepping out of my comfort zone and now I run to the unknown with excitement! It is so important for you to force yourself outside of your comfort zone on a regular basis. Don’t live a sheltered life with a small mind like I used to. I want you to seek out new opportunities and experiences. Push yourself to experience more. It will grow you as a person. If I can do it, so can you. 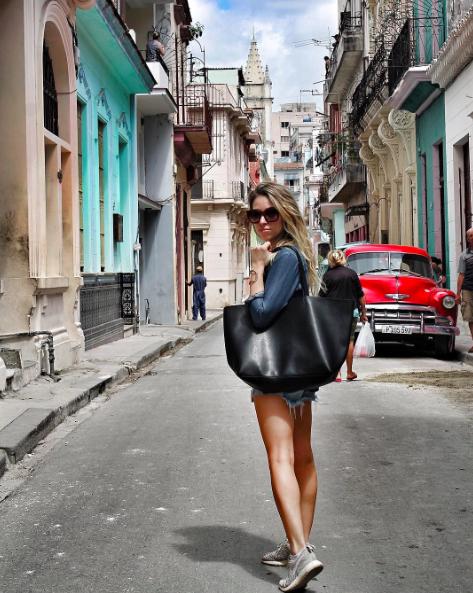 To read about my experience in Cuba click here. To read about my experience in Tulum click here. To read about my experience in Athens click here. To read about my experience in Santorini click here. To read about my experience in Evia click here. To read about my experience in Edipsos click here.